A Limited Designer Overstock score! 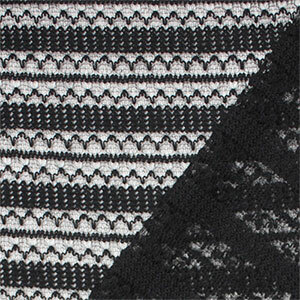 A open crochet type of Hacci sweater knit with a lace style stitch in a black stripe pattern. Fabric is a high-end quality, light to mid weight with a nice stretch and drape. Perfect for sweaters, tops, cardigans, beanies, scarves, and much more!